Hey everyone, it’s Medicine Mondays again. Lately I’ve been talking a lot about finishing medical school and preparing for residency. Today, I’m going to switch gears and talk about something else “The End of Training”. First of all, I want to clarify that I’m not being figurative or philosophical. This is not a commentary on wanting to end the training necessary to become a doctor, or shorten it, or anything. 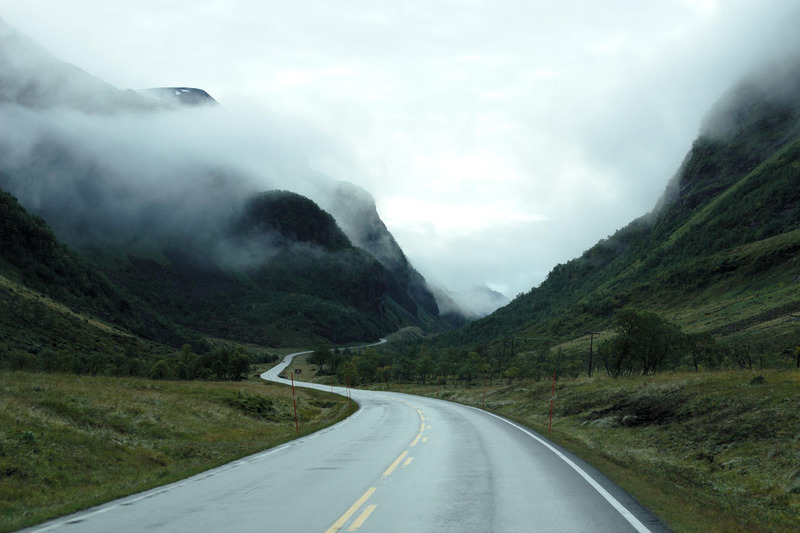 This post is talking about the end of residency or end of fellowship — the end of your training. I am talking about the transition from resident/fellow to attending. Now I want to explain something very important. For many (myself included), finishing your training feels like you’ve crossed the finish line of a marathon. You’re no longer just Dr. Smith, doctor-in-training, PGY-X or whatever. You will now be simply Dr. Smith — no need for further explanation or qualifications. To many, this may feel like you’ve “made it”. This was especially true for me because in radiology we used to take our board examination during our last year of residency. I was already board-certified before I finished residency — but this is no longer the case. This feeling that “you’ve made it” is great… for a little while. However, you will likely eventually think to yourself “oh wow, there is no safety net anymore — it’s just me now — I’m the attending.” You can’t just tell your patients “Let me confirm with my attending.” or “Let me ask me senior.” There is no senior, and you’re the attending. So…? I’ve trained my whole life for this, I’m ready. You’re right — and wrong. You have trained your whole life for this, this is 100% true. However, you will never be “ready” — at least not from training alone. It still holds true here. The peak of “Mount Stupid” is normally as an intern, or 1st year resident in your specialty. 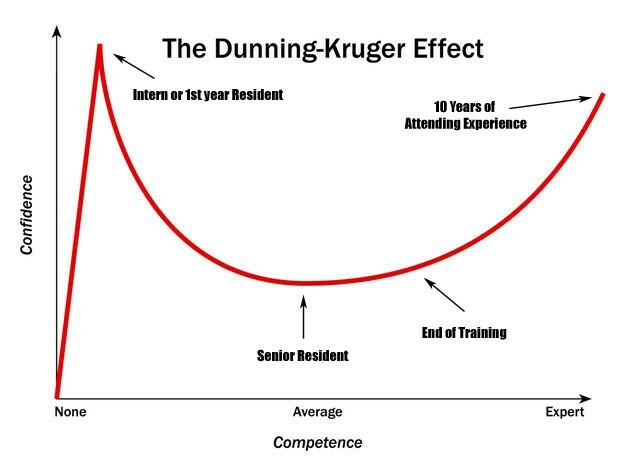 The “Valley of Enlightenment” where your competence is “average” is probably near the last 25% of residency/fellowship. You have gained enough knowledge to know what you are capable of. However, this is another area where people (including me), misjudge where they are on this curve. At the end of your training, you are not yet an expert. In fact, you’re not even close. I admit that I’ve been through all these phases. As an intern, I was overconfident in what I could do — that lasted about a week when the harsh reality of the mountains of information I didn’t know crushed me. Then as a 1st year radiology resident I had an idea of how little I knew — but I was still way off. I was once again crushed by the depth of information I didn’t know. I worked very hard both as an intern and a radiology resident to fill the gaps in my knowledge. My goal was very modest. Learn as much as you can as quickly as possible and do no harm. This was my descent from the peak of Mt. Stupid into the Valley of Enlightenment. It was around my 3rd year as a radiology resident with multiple early call and night float shifts under my belt that I began to settle into things. I knew enough to do a good job, but was well aware of all the gaps of my knowledge that needed to be filled. I spent all of 3rd year and most of 4th year filling these gaps in order to take and pass the boards. My year of neuroradiology fellowship demonstrated something very, very important to me. No amount of learning can replace experience. Conversely, no amount of experience can replace learning. I mean that medicine is very interesting in how it is structured. It’s a very long path, but the goal is very well-defined — with a purpose. As a medical student, this is almost all learning. The first and second years of medical school are a primer to get you ready to be drowned in the vast knowledge of medicine. The 3rd and 4th years are to demonstrate to you how to apply that knowledge and choose your path forward. As a resident/fellow, this is a combination of learning and experience, almost equal parts. You absorb things from being immersed in it. You live and breath it. However, you can’t experience everything, so you still need to supplement your experience with learning. As an attending physician, this is mostly experience, with learning to fill gaps. At this point, you predominantly need experience to climb the Mountain of Expertise. However, you still need to look behind you and fill those gaps in your knowledge. Additionally, medicine as a field continues to improve everyday and you need to keep up with that as well. This is why Continuing Medical Education (CME) is necessary. There is a reason that the path of medicine is structured this way. I used to agree with this sentiment. Why did radiology need an intern year? Why is radiology a 4 year residency? However, now that I am a little older I’ve come to understand something. If anything, training may be too short. 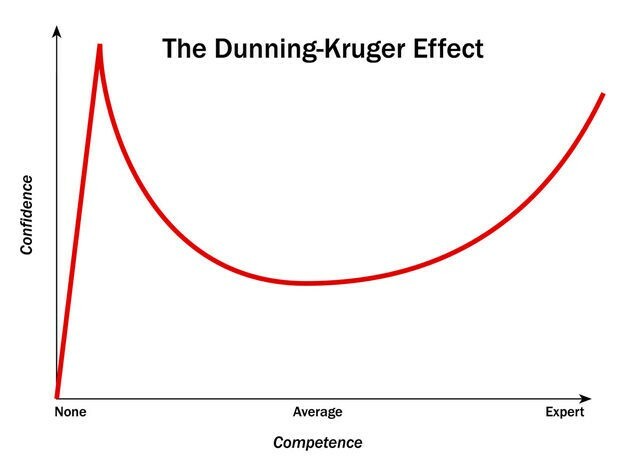 Its length is necessary in order for everyone to go through all the time of the Dunning-Kruger Curve. You must understand the depth of what you don’t know. Additionally, shortening the training doesn’t change the amount of information that you need to learn. It just adds more to learn on the back end as a young attending. You would be crushed as a young attending trying to gain experience and fill larger gaps in your knowledge. Trust me. I get it. I did the 4 years of college and the 4 years of medical school too. Residency and fellowship for me was a combined 6 years. Many times I wondered whether I needed the 14 years of my life in order to get where I am today, or just the 10 years of post-graduate training. You must remember that you’re not doing all this training to push paper around or talk about widgets. Everything you’ve learned and experienced was for one singular goal — to help the patient. This can not and should not be rushed. It was only after finishing fellowship and becoming an attending physician that I truly understood where I was and where I had to go. So where are you then, Sensei? I still have a long way to go, but it’s a goal that I strive for — one that I think all doctors should strive for. The End of Training means the beginning of more Experience, but not the end of Learning. I used to believe that we should shorten training. Now I believe that if anything, training is too short. The path of medicine is one that you can’t rush — and it shouldn’t be. 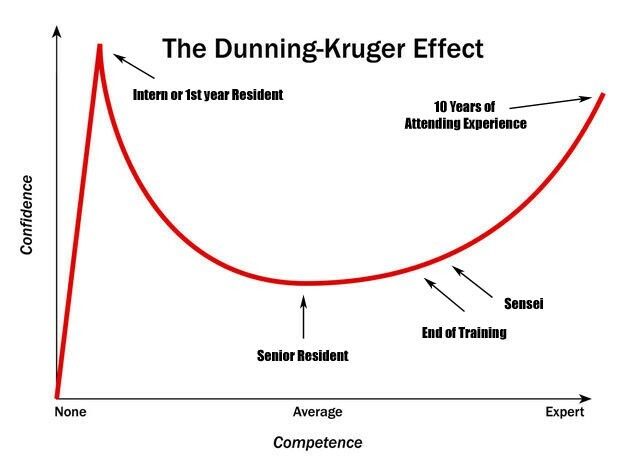 Always be aware of where you are on the Dunning-Kruger Curve. I strive to be an expert someday — I think we all should.